ASCENDING MOUNT PILATUS. The average climb on this railway is almost one foot in three. The central rack-rail with teeth on both sides engages with a pair of cog-wheels on the coach to enable it to climb. The timber platform at the side of the line permits workmen to inspect and maintain the track. This pathway had to be built on supports driven into the cliff face, so closely does the railway itself hug the mountain side. THE project of running a railway to the top of a rugged Alpine mountain some 13,600 ft above sea level inspires admiration for the sheer audacity of its conception. The ascent by rail of the mighty Jungfrau peak in Switzerland had, in fact, already been considered and rejected as impracticable by well-known engineers before the scheme was again entertained by an enthusiastic business man from Zurich. ABOVE THE SNOW LINE. Perched on the slopes of the mighty Mönch are three buildings, the smallest (centre) being the railway station. Beside it stands the hotel and to the right an observatory. During a holiday in the Bernese Oberland, Herr Guyer-Zeller had some varied experience in mountaineering and fully realized how few tourists visiting the Alps for the sake of their unparalleled scenic beauty had the opportunity of enjoying the best and most wonderful panoramas of all - the views from the summits of the great peaks such as the Jungfrau or the Mönch. Because, even assisted by expert guides, a considerable amount of skill and strength was required to conquer any of the really great climbs. 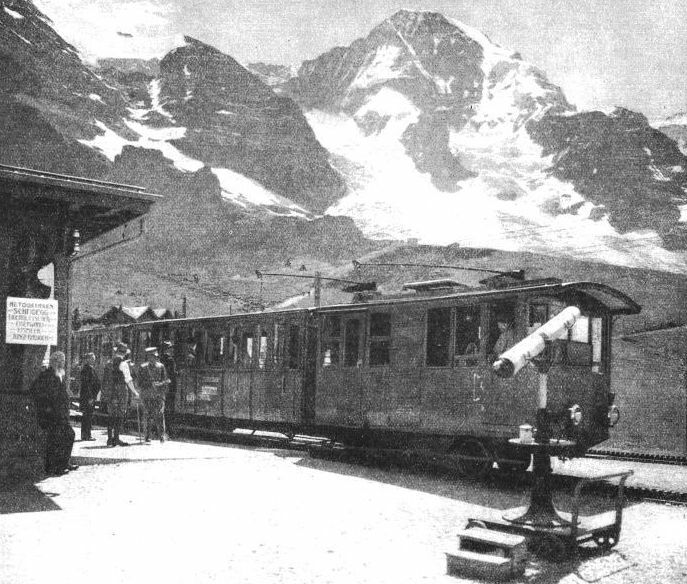 A keen observer, Guyer-Zeller also noted the extreme popularity of the little Wengernalp line that served to carry passengers in a toylike train of one or two carriages up from Lauterbrunnen to Kleine Scheidegg lying at 6,700 odd feet above sea level. Guyer-Zeller began to meditate, and while he meditated he surveyed the gigantic Jungfrau crest soaring 13,671 ft into the clouds. To convey people to those upper snows; to construct a railway - which, once established as safe and practicable, would inevitably be a financial success - to the top of that proud mountain mass was only a dream. And yet. As an immediate result of these meditations Guyer-Zeller laid a truly startling proposal before his unsuspecting financial acquaintances. After the first moment of astonishment had passed, the friends declared his idea to be utterly beyond the realms of possibility. They quoted the names of one or two other eminent contractors who had previously played with the scheme before dismissing it as an absurd fantasy. No, a railway could never be made to climb up the Jungfrau. Map showing situation of the Jungfrau. 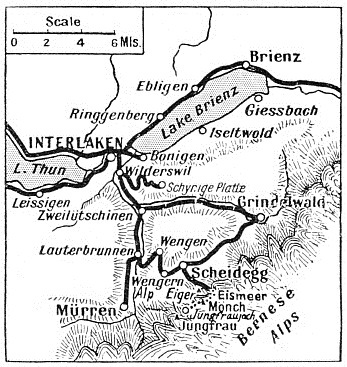 The dotted line below Scheidegg indicates the portion of railway tunnelled into the mountain. But, insisted Guyer-Zeller, these gentlemen had imagined a track traversing the White Lütschine Valley, whereas he proposed to begin his daring construction at Kleine Scheidegg, the place where the Wengernalp railway ceased. If this plan were adopted the builders would have only some nine thousand feet of track to lay before they arrived at the summit of the Jungtrau. The more acute and resourceful among Guyer-Zeller’s listeners perceived a faint glimmer of possibility in this entirely new suggestion. They commissioned surveyors to explore and plot a tunnel and surface route, having Kleine Scheidegg at 6,770 ft as its lower terminus. The condition of a maximum gradient of 1 in 4 on a curving alignment was added to the surveyors’ instructions, a direct length of rail between Kleine Scheidegg and the summit being out of the question due to the sheer steepness of the rise. The surveyors’ party was accompanied by first-class mountain guides, and returned after several weeks of exploring with a moderately satisfactory report and possible location along the route suggested by Guyer-Zeller. Later, the same men undertook a further and more detailed survey. Then the financiers were convinced of the soundness of the project, despite the heavy costs certain to be entailed. A large amount of tunnelling was obviously unavoidable. They backed the scheme. The Swiss Government then gave the enterprise its official sanction, and primary operations began with a supply base at Lauterbrunnen, from where the material had to be conveyed to Kleine Scheidegg over the Wengernalp line. This procedure did not prove so easy in practice, for the tiny trains had a more than sufficient task in handling the tourist traffic. The contractor’s implements and gear, however, eventually arrived at the upper stages after weeks of a transport relay system. Beyond Scheidegg the supplies were dumped on mountain shelves at suitable intervals along the planned alignment. THROUGH A WINDOW OF ROCK. 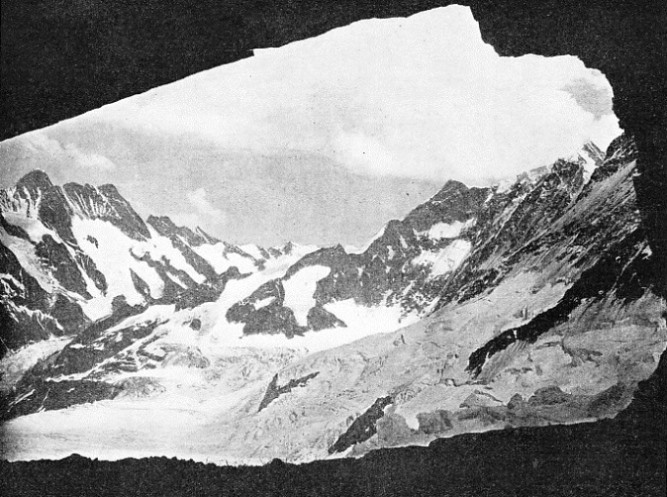 At Eismeer on the Jungfrau Railway, great windows twenty feet wide have been blasted out of the solid rock, and are approached through passageways from the station within the mountain. These windows afford the traveller an awe-inspiring view over the mighty Eismeer Glacier. The building of the first sections did not present great problems, since the rails traversed the Scheidegg Pass up towards the Eiger by means of the ridge separating the Eiger glacier from the Grindelwald valley. Eiger Glacier station lies 6,561 ft beyond Kleine Scheidegg and 954 ft above, so that the grade is almost 1 in 7. This station formed the base for the uppermost section of the constructional works, as this provided the last possible place for the storage of provisions and general equipment. 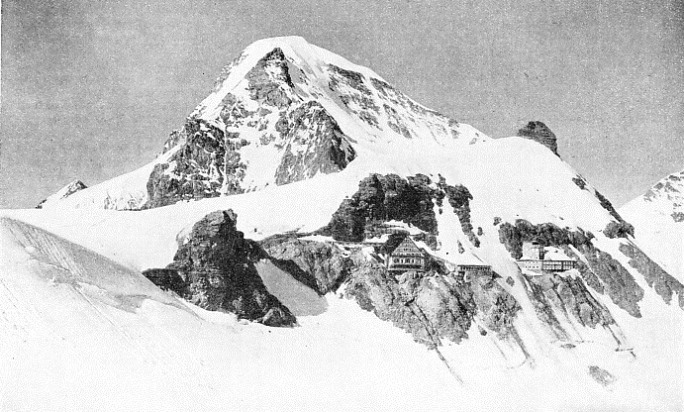 The actual stocking of the station dump received most careful supervision owing to the fact that during the winter months - and the construction was pushed forward all the year without a break - the Eiger Glacier station’s communications with the lower bases were absolutely severed by serious snow falls. One hundred and fifty tons of material and food were stored at this point to maintain the contractor’s workmen. 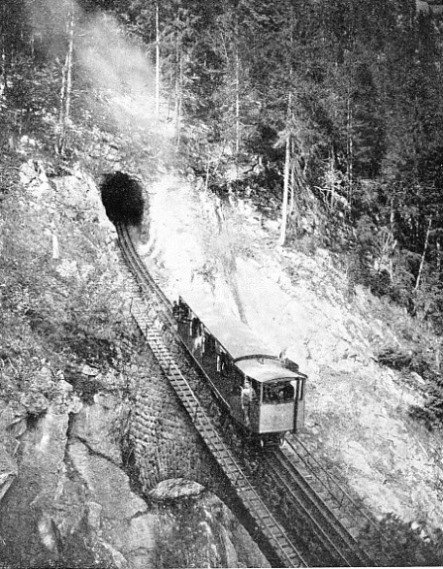 The tunnels had to be bored through from the approach end solely, while the difficulties of negotiating the rock did not permit many drills to operate simultaneously. Even at 7,000 ft the workers suffered from the effects of both cold and the falling in barometric pressure. In the light of which, this is surprising; in the heart of winter it was not an uncommon sight to see the men having their mid-day meal outside any protecting shelter. The apparent paradox can be explained by the dryness of the atmosphere, which greatly decreases the unpleasantness of the temperature, often fifty degrees below freezing-point. ROUNDING A STEEP CURVE on the Jungfrau line. This picture, taken from just above a tunnel entrance, indicates the nature of the gradients encountered, the maximum rise being as much as one foot in every four. The Jungfrau’s sister peak, the Eiger, is in the background. A TRAIN EMERGING from one of the numerous tunnels on the Jungfrau Railway. Note the overhead cables supplying electric current at 5,000 volts to the train and the j-centre rack-rail which engages with a toothed wheel on the driving axle of the power coach. The supreme problem of obtaining an adequate water supply appeared at first a real menace to the success of the undertaking - all mountain streams and springs being frozen over in winter - until the engineers perfected a clever electrical device capable of quickly melting large quantities of snow. But if melting snow solved one problem, snow also set a dozen others. Telephone wires, cables, workings, and the builders’ quarters were frequently submerged. The engineers could repair broken telegraph wires, but they could not avert or remedy the dreadful consequences of a several-thousand-tons avalanche thundering down the mountain side. The small squads of workers were exposed to all that savagery which Nature displays when her forces suddenly find an outlet in the dam of artificial conditions usually holding them in restraint. Blasting cuttings and drilling through solid rock in such circumstances called for courage and endurance. Also, if accidents did occur, the more serious casualties that could not be treated at the local first-aid station had to be laboriously conveyed down the mountain-side to the nearest hospital at Interlaken. In some places, too, tunnelling had to negotiate friable schists - crumbling rock - which naturally increased the general risk attending the task. When one of these difficult patches was encountered the excavation had to be at once secured by supports and later lined with masonry. In other places, however, the drills bit through hard limestone which required no interior baulking. The prevailing lack of water rendered hydraulic drills impracticable, so that electric drills (of the Siemens and Halske type) were adopted after trial. These drills gave four hundred thrusts a minute, developing roughly one and a half horse-power. Beyond the Eiger Glacier station these machines drilled a tunnel six miles long, which takes twenty minutes to traverse and is lit by electricity. The marvel of this mountain tunnel is enhanced by the station being constructed inside, at Eismeer. This has massive pillars, some sixteen feet in diameter, to hold up the roof. It covers an area of about 2,400 square feet. Giant windows have been bored through one wall, and afford the tourist an incredibly spectacular panorama over an unending sea of monstrous waves magically frozen, so it seems, to a silent, motionless world of great mountains and glaciers. KLEINE SCHEIDEGG STATION, 6,770 ft, above sea-level, the lower terminus of the Jungfrau Railway, is linked with Lauterbrunnen and Interlaken by another of the Swiss lines. The wheeled telescope is often seen on mountain stations and is provided for the convenience of passengers. The railway was constructed sectionally, and as each stretch of line was finished it automatically came into public use, and immediately assisted the enterprise by the quick return of some of the invested capital. 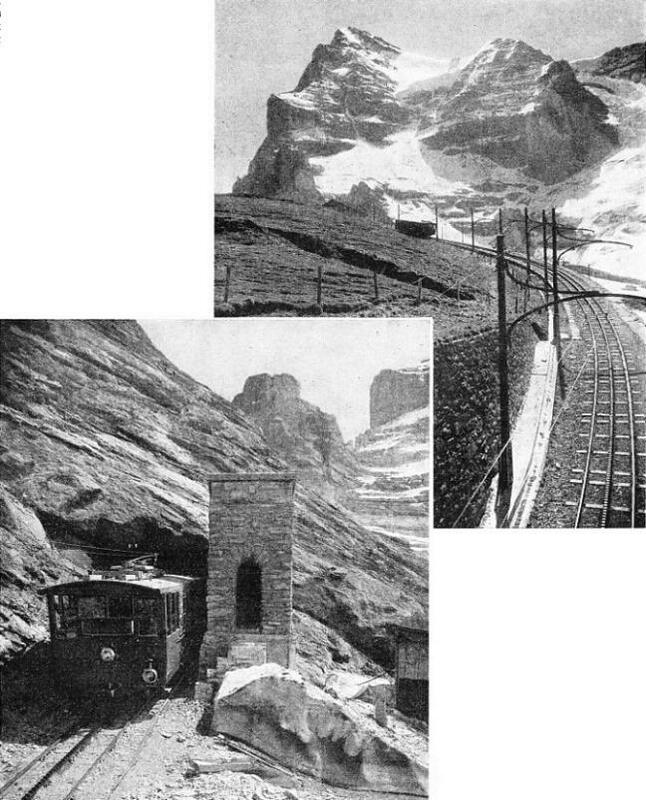 So popular was this new mountain railway, and so great was the attraction of being able to scale one of the most formidable mountains in Europe without expending the least energy or risking life and limb, that when the Eigerwand station was opened the reports at the close of the summer months showed that about 30,000 people had travelled along the line. When the train leaves Eigerwand it continues still in the tunnel on the way to the Eismeer station at 10,370 ft. The Eismeer station resembles Eigerwand except that the track is here doubled to allow the passage of ascending and descending trains. The tourist on leaving the station walks along subterranean ways to emerge from the mountain-side on to snow and into the bitter cold. Before the train can reach Eismeer it must circle round the Eiger, as the two stations, Eigerwand and Eismeer are on opposite sides of the mountain, and the curve constructed for this purpose is of 656 ft radius. A tunnel at 10,500 ft - an altitude which, owing to the rarefied air, called for outstanding pluck and endurance from the workers - had to be hacked through the solid rock and ice of the ridge between the Mönch and Jungfrau. It took six winters for the constructors to fight 3,470 yards. At last daylight glimmered into the workings, and the building of one of the world’s highest stations began. The Jungfraujoch station, in the tunnel itself, lies some way from the arrival platform. The building is of an immensely solid structure to withstand the movements of avalanches; while through its spacious thick glass windows one can see a view of ice, cloud and rock rolling on to the horizon which dazzles and stupefies by the sheer extent of its overwhelming grandeur. The railway is electrically operated, the current being supplied from a power station relying upon the Trummelbach for the necessary energy. The track is of the rack and adhesion type, the toothed rail being centred between the two adhesion ones. Every possible safety device has been introduced, and if the electric current, on which the automatic brake depends, should fail, the train, in running backwards, would generate sufficient energy to work the brakes. Guyer-Zeller, the originator of the wonderful undertaking, died before the present line was completed, but he had an even more ambitious project in view. He planned to carry the tourist right to the Jungfrau’s snow-covered summit. 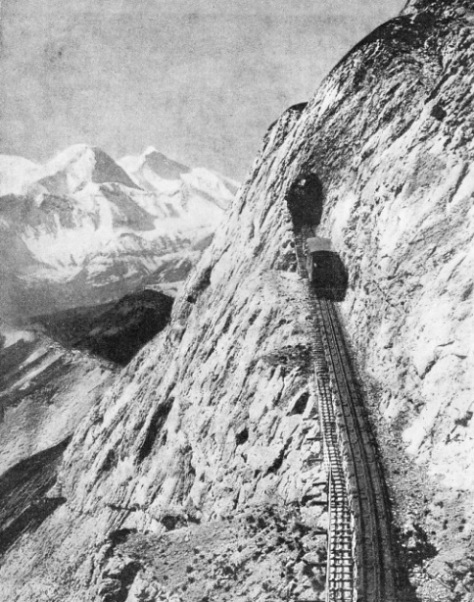 This final stretch would have been the most arduous of all, for no railway could possibly climb to the summit, so Guyer-Zeller planned that this should be reached by a lift. THE STEEPEST SLOPE on the Pilatus Railway. The train is descending over a bridge on a gradient which drops 48 ft for every 100 ft of track. To ensure complete safety, specially powerful automatic brakes are continually in action, to prevent the train exceeding a strictly limited speed. The conquest of the mighty Jungfrau by rail ranks as one of the most extraordinary feats in European railway engineering, and the ingenuity and skill of the undertaking can only be measured by the astonishment of the tourist at the ease and facility with which he is brought to the region of the clouds. Another notable chapter in the conquest of the clouds by rail was the construction of a line up Mount Pilatus to an altitude of 6,791 ft, having a maximum grade of nearly one in two. It was largely the railway’s triumph in ascending the Rigi that inspired the engineers to attempt a similar ascent of Mount Pilatus. The same objections encountered by the originator of the Jungfrau railway assailed the supporters of the Pilatus enterprise. The engineers who so boldly contemplated the scaling of Mount Pilatus by rail were Colonel Edward Locher and Mr. E. Guyer-Frenler of Zurich. The critics of the scheme were ironical at the engineers’ expense, declaring that even a mountain goat would find it extremely difficult to reach the summit of Pilatus. Certainly, the proposal did appear to verge on the impossible. The grades would be abnormal, avalanches and rock displacements would inevitably play havoc with the metals, and the cog-wheels on the engine engaging with a rack-rail would be unable to cope with the almost perpendicular rise. Nor did the engineers mean the track to follow a devious path. They planned to reach the summit by the shortest possible route. Great abysses and gigantic overhanging promontories were to be bridged or tunnelled through. To surmount the precipitous grades up which the line would have to be built, the engineers adopted an entirely new rack-rail system embodying the Fell centre rail scheme in which horizontal wheels beneath the locomotive grip a centre rail. On the Pilatus railway, therefore, it was proposed that instead of laying an ordinary rack-rail (with teeth on top) between the two outer lines, the rack-rail should have teeth on either side which would be engaged by cog-wheels set horizontally under the locomotive. ABOVE A SEA OF CLOUDS. From this station on the Pilatus Railway the visitor can look down on to a sea of clouds, from which the mountain peaks emerge as islands. Beneath these clouds is the fascinating town of Lucerne. The upper terminus of the railway is at the right of the picture. The main building is an hotel. When the engineers had at last persuaded the authorities that both this new rack system and the solidity of the permanent way would ensure perfect safety for the public, permission was granted to build the railway. The surveyors allocated a route nearly three miles long, in the course of which the train had to mount to an elevation of over 5,340 ft. They decided that the bed of the railway should consist entirely of solid masonry, and a gauge of 2 ft 7½ in was selected. 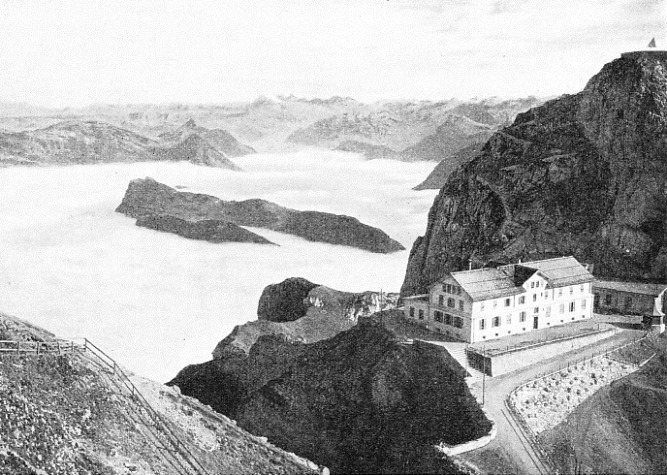 The terminus of the railway is at Alpnachstad on Lake Lucerne, and this formed the constructor’s base, from which the line was gradually pushed up the mountain slopes. The lowest sections of the line were first used to convey men and material to the advancing railhead, as is usual in railway construction. Although operations in the open had to come to a halt during the winter months, the tunnel drilling proceeded throughout the year. On some of the steepest sections of the railway only a shelf sufficient to carry the track was blasted out of the rock. And in many places to-day there is hardly a foothold for the gangers who have constantly to supervise the permanent way. The line can be described as a path of granite clinging to a mountain side. The bridges spanning numerous gaps and chasms are of a particularly massive nature. The constructors took no risks. The lengths of the rack-rail are made of wrought steel, the teeth forming the rack being cut in the solid metal. It is the use of the rack which has made the line possible since the easiest gradient rises 1 ft in 5 ft, the steepest slope rising 1 ft in 2. A special type of steam locomotive was built to cope with the rising track, for as the boiler could not be set lengthwise in the usual fashion, it was placed crosswise. The underframe of the carriage, combining the engine and passenger accommodation, carries the locomotive’s water tank. The brakes are designed to give absolute safety. When descending, an air-compression brake and a frictional brake on the engine crankshaft come into play, besides the automatic brakes on the wheels that are actuated the instant the train attempts to exceed the speed limit. You can read more on “Rack Rail Locomotives” and “Wonderful Alpine Ascents” in Railway Wonders of the World, and more on “Stone and Steel on Pilatus” in Wonders of World Engineering.